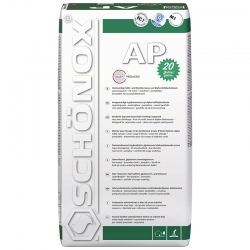 SCHÖNOX AP is a synthetic gypsum self-levelling compound for use from 1 to 45mm, especially suitable on all gypsum substrates as well as on cast asphalt screeds according to DIN 18 560. Can also be used on cement substrates in interior areas. After adding of 6 litres of water to 25kg of powder, SCHÖNOX AP is ready to use. 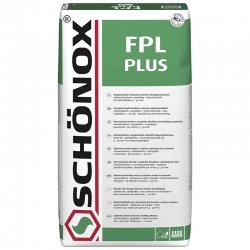 SCHÖNOX FPL PLUS is a self levelling compound for use from 3 to 60mm, with aggregate 60mm. SCHÖNOX FPL PLUS is noted for very little shrinkage. After adding of 4.5 litres water to 25kg of powder, SCHÖNOX FPL PLUS is ready to use. Interior and exterior. SCHÖNOX SL is a cement based, rapid drying, smoothing and finishing compound suitable to provide a smooth finish on various substrates in interior areas. SCHÖNOX SL can be installed as a true featheredge. 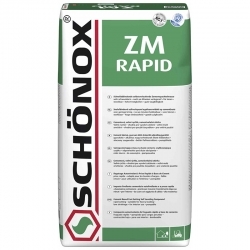 SCHÖNOX XA is a very low emission, calcium sulphate based smoothing and levelling compound especially suitable for all calcium sulphate based subfloors as well as mastic asphalt screeds according to EN 13 813. Also for interior use on cementitious subfloors. After adding 6 litres water for 25kg powder, SCHÖNOX XA is ready for use. SCHÖNOX DSP is a very low emission, premium levelling compound for direct use for all suitable substrates in exterior and interior areas. Especially suitable for levelling of industrial floors as well as garages and cellars. 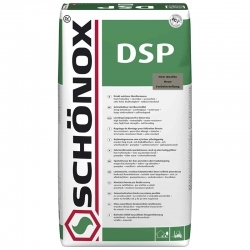 SCHÖNOX DSP is characterised by a low material shrinkage, very good flow properties and a homogeneous concrete gray appearance. 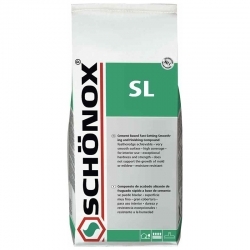 SCHÖNOX LC is a high performance two component latex levelling compound for use from 3 to 60mm, charcterised by low shrinkage. 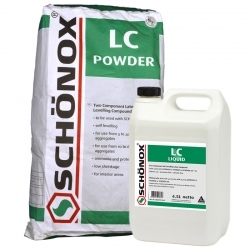 After adding the liquid component (4.75L) to 25kg of the powder component SCHÖNOX LC is ready for use. For interior and exterior use.